(a) Calculate the magnetic flux through the wire loop. (b) The loop is rotated through 180º about a central axis (fig) which is parallel to the straight wire. 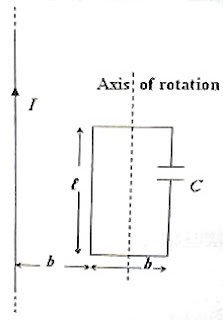 If the time taken for this rotation is ∆t, determine the magnitude of the emf induced in the loop. (c) The loop is kept stationary and instead of the steady current I, a current ‘i’ varying with time t as i = Im sin ωt (where Im and ω are constants) is passed through the straight wire. Calculate the maximum value of the emf induced in the wire loop. (d) Determine the maximum current induced in the wire loop under the conditions mentioned in part (c) above. Try to answer this question. You can take 15 minutes for answering it and can score up to 15 points for the right answer. I’ll be back soon with a model answer for your benefit.